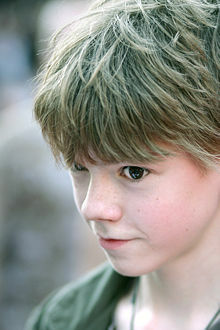 THOMAS SANGSTER's television debut was in the BBC Film The Adventures of Station Jim, playing alongside Prunella Scales, George Cole and Frank Finley. The telefilm was a delightful story about a runaway orphan finding sanctuary on a steam railway. This was followed by a lead role in the Showtime Original film Bobbie's Girl, in which he was cast alongside Jonathan Silverman, Bernadette Peters and Rachel Ward. Immediately after, he was whisked off to Vancouver to take the lead in The Miracle Of The Cards, the telefilm version of the true story of Craig Shergold, who was diagnosed with cancer at age ten and recovered with the help of an anonymous benefactor and enough get-well cards to enter him into The Guinness Book of World Records. Thomas then appeared in the BBC's Emmy and BAFTA award-winning adaptation of Clive King's wonderful story, Stig of the Dump. It tells the tale of Barney and his friendship with a caveman named Stig. Thomas received glowing reviews as Barney, all wide-eyed wonder and innocent adventurer. He next appeared in the action telefeature Daddy, which gave him the opportunity to work alongside Klaus Maria Branduer. This was Thomas' first thriller and he loved all the action scenes, explosions, shootouts and car chases. His performance won him the Best Actor in a mini-series award at the 2003 Monte Carlo Film Festival. Love Actually was Thomas' first international feature film in which he played Liam Neeson's son, and for which he received a Satellite Award nomination for Best Supporting Actor in a musical or comedy. His training for Love Actually involved learning how to play the drums, perform cartwheels and (most challenging of all), have his first screen kiss.